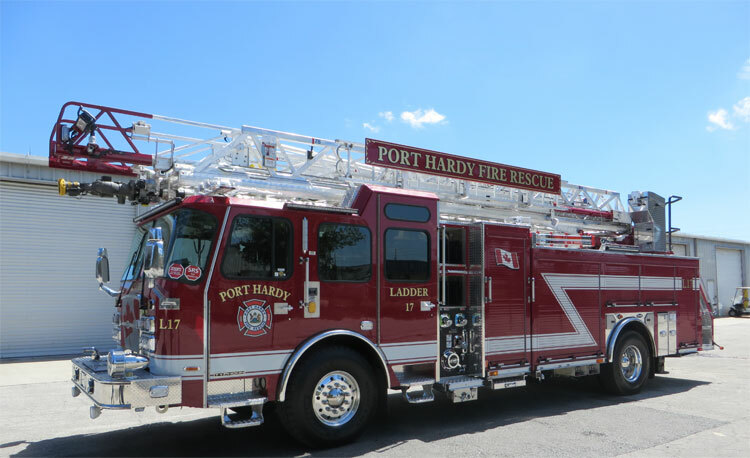 After a study of high-rise structures in its fire protection district, Port Hardy (BC) Fire Rescue learned it had 18 four-story structures that didn’t allow full access to them as the department didn’t have an aerial device, and the longest ground ladders it carried on its pumpers were 35-foot extension ladders. The department immediately got to work spec’ing out an aerial vehicle. The resulting vehicle built by E-ONE for Port Hardy is an E-ONE HP78 eMAX quint on a Typhoon X chassis and medium cab with a 58-inch cab-to-axle length and 3/16-inch aluminum construction with roll-cage type design that, according to Joe Hedges, E-ONE’s product manager for chassis and aerials, “exceeds NFPA requirements by five times.” The cab has frontal and roll-technology side air bags, seat belt pretensioners, and seating for six firefighters with the crew cab having two rear-facing seats and two forward-facing. The E-ONE HP78 eMAX quint carries a 1,585-gpm single-stage pump, a 470-gallon water tank with a 30-gallon integral foam tank, and an FRC PumpBoss PBA400 pressure governor. Lighting on the vehicle includes Whelen’s 600 series Super LED lower level warning light package and Whelen 600 series gradient Super LED surface-mounted scene lights. Borg points out that Port Hardy wanted all LED lighting on the aerial so there was no need for a generator, although the department carries a portable generator for use away from the truck. “By going with LED lighting, we were able to double the amount of lights from our past specifications but still stayed within the capacity of the alternator of the truck,” he says.